If I were to go back in time and tell my nine year old self that I’d be able to guess the grade of sandpaper by touch alone, I think I would have thrown my Tamagotchi on the ground and fled the room in a fit of humiliation. But that was 1993, and I thought Tamagotchis were cool. Sandpaper is paper covered in sand. Self explanatory. It’s famous for smoothing edges and flattening uneven grain. There are very few things you can make in a woodshop that don’t, in some way, involve sandpaper. For such a simple invention, it has never become redundant. I can respect that. Sadly, despite all this, I don’t enjoy it. I am always trying to reduce the amount of sanding I have to do. It’s exhausting and to be honest, it hurts my arms. I find it dull. It’s the iceberg lettuce of woodworking. I’m not sure why I don’t enjoy it. I think the monotony has something to do with it. Sanding is more of a stepping stone, and most people just want to get to the other side of the river. I want to enjoy it, but there only exists a few moments where this is possible. If I’m particularly disciplined… and I have lots of time… and there is nothing else to do… sanding can be quite therapeutic. It shocks me every time. If I focus my mind just on the sanding, clear my head and put away my phone, I can get lost in a strange kind of ‘sawdust meditation’. When this happens I find myself on that stepping stone in the middle of the river, actually enjoying the view! Then as quickly as it came it disappears. My arms begin to hurt, I remember why I don’t like it and I go inside for a cup of tea. Sandpaper can do wonders for your enlightenment, but nothing beats a cup of tea. There are more clamps in a woodshop than wood. You simply can’t have enough. They come in many different shapes and sizes, but all do one thing – clamp something to something else. Simple, but crucial. Whether it’s making a jig, securing a machine or glueing up a panel, a clamp is always there for you, offering you a hand. A very strong, clamped hand. Finding the right clamp for the right job is essential. Some get more airtime than others, which is sad, but that’s the industry. For the majority of the time, they are cumbersome and tricky to use. Just figuring out the safest and most effective way to position a clamp can take a long time. I think they relish this attention on some level, and that’s OK. When all you do is ‘squeeze’, life must get particularly tedious. One afternoon, I decided to make a bunch of little picture frames out of scrap wood. Instead of using clamps, I thought I would squeeze the glue joints together using just my hands. I frequent the gym, how could this go wrong? When my father came in the following morning I went to show him my creations. I’m not exactly sure what the cause of the first break was, most likely a mild wind, but the entire frame collapsed instantly in his hands. Oh dear. I moved towards the rest of the frames to investigate. Under what can only be the weight of my intention, the frames began to disintegrate one by one. After the tenth one collapsed I had given up. I figured they were just breaking from indifference at that point. My father reminded me that I needed the strength of the clamps to bind the glue properly. I knew he was right. My hands were as effective as a moth pushing a Honda. Onwards and upwards. I have strength in different areas, for which I am very grateful. I may never be a clamp, but a clamp will never be me! Brushes have a very short lifespan in our woodshop. This is not their fault. And nor is it my Father’s. Regretfully, I have to take responsibility for these early deaths. I get distracted with something else and forget to wash them. If this happens, they solidify and die. We tend to use standard brushes for most things, but sometimes we use the foam brushes for putting on stain or polyurethane. The foam ones have an even shorter lifespan, and that’s not even my fault. They have a weak disposition. If you’re made of foam, you’re not long for this world. I feel like they know this, so it’s not so bad. Deciding what kind of brush to use and keeping your brushes clean is essential. If you use a rough, hard bristle brush for putting on a coat of polyurethane, you’ll end up with streak in your finish. Not ideal. Similarly, if you want a rustic shabby chic finish, you need a rough brush to give texture to the paint. Brushes are not cheap, and they are integral to producing a clean, sharp finish. So why do I let them die? I get distracted. Something more exciting grabs my eye, like building the rest of a Cedar Hope Chest. All the while, the brush I was just using quietly shuffles off it’s mortal coil behind me. Not exactly a glamorous exit. What’s even worse is that when I eventually need the brushes to finish the next piece, they’re all dead. I get frustrated and sad because I neglect the very things that I will ultimately need. I’m impatient, and lazy. Washing them takes about three minutes. Those neglected three minutes turn into an unfinished Hope Chest, seven dead brushes and a thirty minute drive to Home Depot. One afternoon, I had forgotten to clean my brush after using polyurethane. When I returned to the shop a few hours later it was as stiff as a corpse. My father took the dead brush and hung it up near the paint tins. Perhaps it was a warning to the other brushes, but i’m fairly certain it was a reminder for me. I look at that hanging brush in the woodshop, and endeavor to clean my brushes. If I respect the smaller things in life, I can enjoy the bigger things that follow. And above all, save myself a trip to Home Depot. Wood glue is stronger than most things in the world. Well, that’s a mild exaggeration, but you get the idea. I still don’t understand how it can bind wood so tightly and yet peel off your hands like crepe paper. The legend goes that if you glue two pieces of wood together and try to snap it in half, another area of the wood will break before the glue joint breaks. It’s not so much a legend as it is fact. It really is strong. The best way to use wood glue was taught to my father by my sister’s grandfather (convoluted, but accurate). He would put a thin layer of glue on both sides of the join and then leave it for a few minutes to get tacky. Then, when the two pieces were clamped together the wood would bond immediately. It’s risky because you don’t have any time to think or re-adjust. When the glue starts to set you’re finished. There’s no back-up plan. If you look hard enough, there’s an intense drama to woodworking. Stain is the arch enemy of wood glue. It doesn’t like it. It refuses to cling to it. The best way to remove ‘oozing’ wood glue is to wait until it’s nearly set and then scrap it off with a chisel. This is very satisfying. The little beads of glue pop off in all directions. Again, this baffles me. How can it bond something so tightly, and yet ‘pop’ off the surface at the same time? It’s as if the glue knows it has one job. If it’s not bonding two pieces of wood together it just accepts it’s not needed. I like this. It knows itself, on some philosophical level, the glue knows itself. I feel less enlightened than wood glue. However, there are some things we can learn from it. Through all of the ups and downs, just remember, the parts of yourself that you had to glue back together are the strongest. Wood putty is a complex substance. It battles with identity issues and lives an ongoing lie. It looks like brown wasabi paste, smells like nail polish and pretends to be wood. The main purpose of putty is to fill small cracks, breaks or flaws in the wood. When used correctly, it can make your finished coffee table look flawless, and hide a multitude of sins. It’s basically make-up for furniture. There’s always been a dirty side to glamour, and wood putty is just that. It comes in a variety of different shades, and it’s important to use the right shade for the right wood. 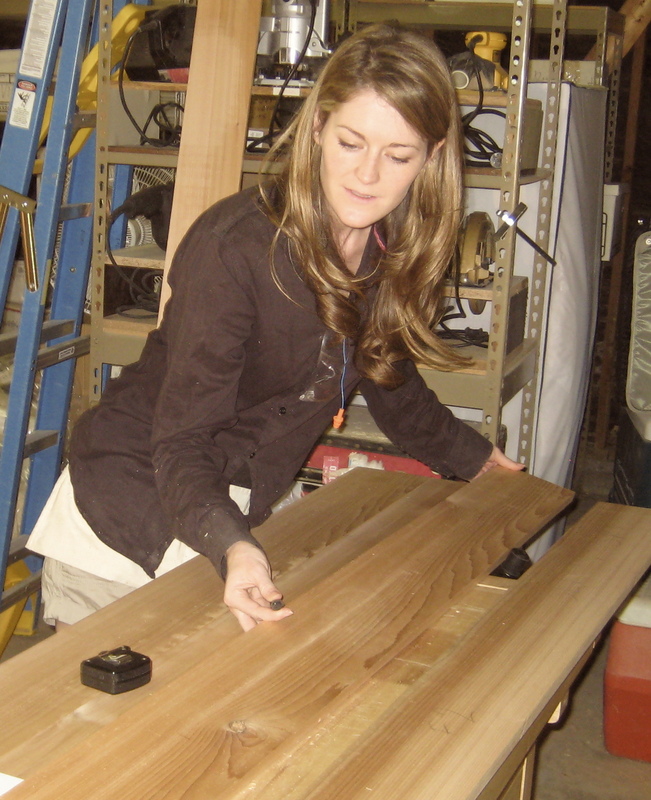 We often test the putty on scrap wood to make sure it blends correctly with the final product. This can take hours. There are some high-octane thrills in woodworking – selecting wood putty isn’t one of them. Putty can be temperamental. If you leave the lid off too long, it dries up and turns to sand, and if you get it on your hands, it’ll stay there for days. It really is complex. Complex and high maintenance. Not a great combo. But, when it works, wood putty truly is amazing. It can make a small crack look seamless and all those moments of high maintenance were worth it. All those times you couldn’t get it off your hands, or took 4 hours to finally realize that walnut was the right shade, it was worth it. I always try and remember what it must be going through. It’s not wood. It’ll never be wood. But it’s asked to pretend to be wood every day. That’s tough. It’s told not to be itself, but instead, blend into the background and take zero credit. I wouldn’t apply for that job. Wood putty is selfless. And because of that, I like it. Forget the fancy hand saw or the beautiful piece of solid reclaimed oak. I aim to be like the putty. Those small little cans sit unassuming in our shop, and act as a constant reminder. If I can be as selfless as wood putty, then I’m doing alright. Possibly one of the most enjoyable and tiring jobs in the woodworking world is checking for twist. There are few things in life that bring me the same level of calm as methodically selecting 6ft Douglas Firs and checking for twist in the wood aisle. I sound incredibly boring, I know. But I’m OK with that, and I urge you to be too. Checking for twist isn’t necessary in some areas of woodworking, but for building furniture it’s essential. A twisted board looks something like a banana and will ultimately make your bench look like a curly fry. I know what you’re thinking – those sad little twisted ones get left behind. Don’t worry, they don’t, they get used for something eventually, just not benches. Silence. Even the crickets were quiet. She looked up at me and handed me my receipt. I left the store feeling deflated. I wasn’t angry, they were just trying to help. I confused them, and all I wanted to do was fit in. I’ve realized over the years that, sometimes, people have a little twist in them too, and that’s OK.
We’re not meant to be benches. The word ‘harvesting’ is just a fancy way of saying ‘choose the best bits’. Before you touch blade to grain, you need to figure out which parts of the wood to use and how you’re going to cut it all up. This sounds dull, but bare with me. First, lay down the large hunk of oak you bought and mark out the pieces you’re going to need with a wood crayon. Simple. There’s even a crayon involved! Ideally you want to save as much wood as possible without wasting too much (it’s getting less simple). Plus, you want to find the nicest piece of the wood to use. You have seven more pieces to harvest using three boards and one of the ends has a crack that looks strange and it’s already 8pm… You’re exhausted. You feel lied to. You go inside for a cup of tea. 2. Which areas will produce the best piece of furniture (the artist). These two fight it out for about an hour and, as always, the artist wins. I don’t know why I even listen to the cheapskate in the first place. I guess she always just comes out the gate strong. After you win the war between penny-pincher and artist, you slowly realize that it’s not so simple. The word ‘harvest’ has led you to believe this process will be more fruitful. I can get a little OCD when it comes to harvesting. I fret and obsess over ever corner of wood and every interesting knot. Maybe it’s all the tea I drink. Maybe it’s Maybelline. Either way, I enjoy harvesting and i’m not afraid to admit it. Harvesting is where the entire process begins. The beginning is so exciting. It might be time consuming, and you’ll waste hours staring at oak whilst holding a crayon, but it’s important. This detailed process is what makes the final piece so spectacular. If we don’t enjoy the process, then life is just a long line of wasted tea breaks. And I don’t waste tea.